One of the continuing themes as we interview law school deans around the nation is the idea that the legal profession is continually changing and evolving, and that the nature of legal education must likewise adapt to meet the needs of future lawyers and the public they serve. Northeastern University School of Law in Boston is a law school that fully embraces the idea of change and innovation. According to its website, NUSL "seek[s] to amend traditional notions of what law can achieve." Its experiential Cooperative Legal Education Program allows law students to graduate with almost a full year of full-time legal work experience. Since 2012, Jeremy R. Paul has served as dean of Northeastern University School of Law, where he also teaches Constitutional Law, Property and Jurisprudence. Dean Paul obtained his undergraduate degree from Princeton University and his law degree from Harvard Law School. 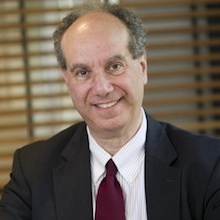 Prior to becoming dean of NUSL, he was a professor of law and dean of the University of Connecticut School of Law, serving on the faculty there for 23 years. He is a renowned legal educator and widely published author. Finding the necessary financial resources to support academic instruction and research of the very highest quality. Consumer law; Energy Law; Laws governing robots; cybersecurity. Clinical instruction is far more prevalent. Students are accustomed to visual aids such as Power Point. Curricula are and should be more interdisciplinary. But remarkably there are more similarities than differences between classrooms of today and those of the late 1970's. Indeed, my mother took Contracts in 1949; I took it in 1978; and my youngest son just last year. I suspect that any of us would have felt right at home in all three courses. More and more crimes and interrogations will be captured on film so that there will be video evidence. Surveillance of all kinds will become more prevalent. There will be a temptation to use Skype for witnesses, even including defendants. And, of course, all sorts of identification techniques such as DNA evidence will continue to improve. The Court will confront powerful challenges to the bedrock beliefs of our country. These will focus on efforts to curtail voting rights; assertions of broad executive authority; attacks on freedom of the press; and even greater restrictions on access to courts. My favorite days in law practice were the days I got a new case or a new problem. I have those as dean as well, but practice offered a greater variety of entirely different challenges. If you could invite any three legal or governmental identities (living or dead, real or fictitious) to a meal whom would you invite? When Barack Obama was elected President, people were rightfully thrilled but also somewhat surprised that the country had elected its first African-American President. But I was even more surprised that we had chosen a former President of the Harvard Law Review. I would love to ask him how he thinks the country can escape its current era of destructive polarization. I would like to have dinner with David Simon, the creator of The Wire, the most trenchant commentary on our Legal System I have seen. And my final choice would be Roberto Unger, who is among the most brilliant writers I have had the privilege to read. My favorite legal movie is A Few Good Men. Tom Cruise's cross-examination of the Jack Nicholson character that leads to Nicholson's famous crack-up on the witness stand is just priceless. For more information and to learn more about what our criminal defense law firm does and how we help our clients visit our homepage.